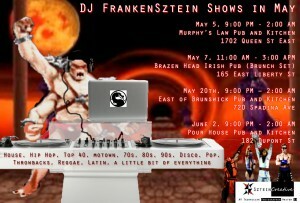 DJ FrankenSztein Dates in May 2017! I’ve got some great shows coming up this month at four of Toronto’s finest establishments! Come on out and I’ll play your song! This entry was posted in DJ FrankenSztein. Bookmark the permalink. ← DJ FrankenSztein shows in February 2017!